At the beginning of 2018, Africa watchers were still reeling from the departure of Robert Mugabe. The Zimbabwe leader’s 37-year tenure had been figuratively bayoneted by his own army in an apparent coup.The question on everyone’s lips: Would this signal the end of strongman rule in Africa?Zimbabweans were quick to remind us that the new Emmerson Mnangagwa presidency was simply a case of different feet in the same boots.All across the continent, old men such as Cameroon’s Paul Biya were running again in elections despite having already served 36 years as President. In Nigeria, the ailing Muhammadu Buhari was prepping for another election in 2019, while Uganda’s Yoweri Museveni was at increasing loggerheads with a youthful population whose loyalty he could no longer command after scrapping the presidential age limit.Yet one African leader’s 2018 story has gripped the continent’s imagination because of the heady pace of change his appointment has engineered. Abiy Ahmed took over as Ethiopia’s Prime Minister in April. At 42, he carved a path through Ethiopia’s tense, ethnically divided landscape by becoming the first Oromo to lead his country.The Oromo, Ethiopia’s largest ethnic group, had never been in prominent positions of power. Grievances of their economic and political exclusion drove anti-government protests across the country.For years, Ethiopia had been engulfed in states of emergencies; protests were met with a government crackdown and thousands fled across the border into Kenya. Under public pressure, Hailemariam Desalegn dramatically and unexpectedly resigned.Abiy joined the Oromo People’s Democratic Organisation as a teenager. He stayed close to his people, even as he claimed victory in an internal Ethiopian People’s Revolutionary Democratic Front vote on March 27 to become chairman of the ruling party. That victory secured his place as Prime Minister of an East African powerhouse. 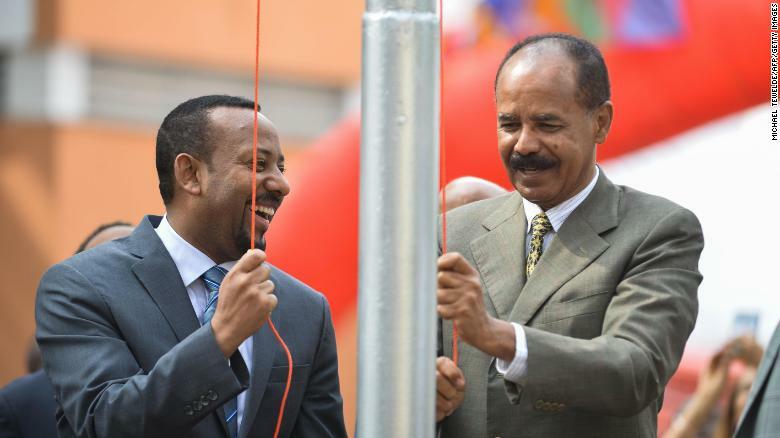 Abiy, left, and Eritrean leader Isaias Afwerki celebrate the Eritrean Embassy’s reopening in Addis Ababa.To understand just what kind of a place Ethiopia had been before his appointment, its recent history shows a nation riven by ethnic tensions among more than a dozen different ethnic groups. Serious conflicts had raged between the Oromo and the Somali region, for example.According to the Internal Displacement Monitoring Centre,1.4 million people were displaced in the first six months of 2018 because of ethnic conflicts in Ethiopia.This displacement issue has not gone away despite Abiy’s inclusive leadership style, which has brought in major groups, including many more women in the Cabinet.Ethiopian state-affiliated broadcaster FANA reported that 21 people had been killed in “inter-communal violence” between Oromo and Somali communities in southern Ethiopia’s Moyale in mid-December.Before the new Abiy era, rival politicians and unfavored journalists were either in exile or locked in Ethiopia’s jails, including Addis Ababa’s infamous Maekelawi prison, where many alleged abuses took place. 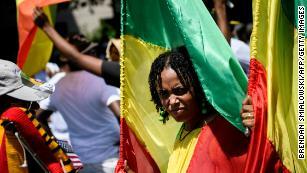 Ethiopians abroad eye return as reforms kick in back home And to the north and east of the country is Eritrea, with which Ethiopia had fought a pointless war over disputed border territory at a huge financial and human cost.As Abiy was sworn in, it soon became clear his agenda to change all that had come before was genuine. He shut down Maekelawi prison, freed journalists and invited all political exiles to return and stake their claim to a free and fair 2020 election.Back in June, as prisoners were being released on Abiy’s orders, a legislator in the Ethiopian Parliament asked the Prime Minister if it was constitutional to release people who had been jailed for terrorism and corruption. Abiy reportedly responded: “Jailing and torturing, which we did, are not constitutional either. Does the constitution say anyone who was sentenced by a court can be tortured, put in a dark room? Torturing, putting people in dark rooms, is our act of terrorism.”This was a profound admission by a Prime Minister, unheard of in modern-day Africa. Under Abiy, Ethiopia has gone from being one of the world’s worst jailers of journalists to for the first time in more than a decade of having no journalists in prison.In May, CNN spoke to Eskinder Nega, one of the first journalists and high-profile dissidents to be released as part of the government’s promise to expand freedom of expression.He was cautiously optimistic: “The Prime Minister should be given the benefit of the doubt, he deserves at least a hundred days — the famous American honeymoon period.”December saw him back in Addis Ababa, editing a weekly newspaper. Is he happy with progress under Abiy?”Even though 100 days (have) passed, the honeymoon period is still there. But ultimately our safety will come if we have a democratic system. Unfortunately, we don’t have the democratic framework that will ensure our independence.”The style of leadership was different from anything seen before in Ethiopia’s ruling party. There were “listening rallies” attended by tens of thousands, town hall meetings in which the vision of true democracy and unity were re-emphasized.